This schematic covers the complete 1st VERSION Rainbow E-2 (e SERIES™) face plate assembly as well as the rear cover assembly. These items include the water pan neck, shroud, and springs on the face plate and the cord caddy ears, exhaust cover, and retainers on the rear cover assembly. This version has two screws that hold face plate and four screws that hold the rear cover assembly. The second version, both of these parts snap into place. Effective serial number 9000000 with a start date of August 5th 1998 through serial number 9279999 and an end date of March 26th 2000. Faceplate assembly for the early version E-2 (e SERIES™) Rainbow. This item requires two screws in the bottom of the faceplate for installation. It also does not have a flange on the water pan neck. This part was effective through serial number 9049289. 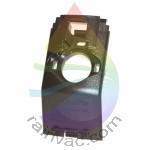 Water shroud power nozzle receptacle door for the E2 Type 12 (e2 Silver, Gold), and E-2 (e SERIES™) version Rainbow systems. Will fit but does not match the e2 Black (E2 Type 12) version. 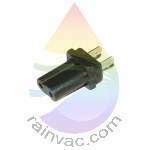 Power nozzle receptacle for the original PN-2E and Gold version electric hose assembly. 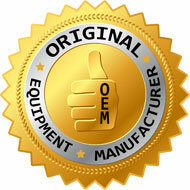 Also fits the main unit E-2 (e SERIES™) face plate assembly. Water pan neck for the E-2 (e SERIES™) Rainbow system effective through serial number 9049289. This neck is only used with the R7284 water pan gasket. You also need to make sure that the neck gasket area is a pocket design. If you are unsure, please call our technical support team at 800-640-2033. Stripped faceplate for the E2 Type 12 (e2 Silver, Gold), and E-2 (e SERIES™) Rainbow system. If you are replacing on an early version E-2 (e SERIES™) Rainbow, you will need to make modifications as in drilling two holes to allow mounting lower portion to housing as well as removing downward ear that is in-between the two areas that you need to drill holes. *Note: If you have an early version that has two screws below the intake, you can select the option to have us drill two holes and clip the ear to ensure an exact fit. Cord caddy assembly for the R7384 rear cover assembly that fits early version model E-2 (e SERIES™). If you have to take four screws out of the rear cover assembly to replace your HEPA filter, then this is the correct part. Rear cover assembly for the early version E-2 (e SERIES™) Rainbow system. To replace this part, you need to remove four screws. Two behind the cord caddy assembly, and two at the bottom on unit. If you can remove the rear cover assembly by pressing in two tabs, then this is NOT the correct part. If you are having problems with the Rainbow locking into the dolly, check the tab at the bottom of this part to see if it is broken. Manufacture markings stamped on the inside of this item include R-7319-x. Cord caddy frame that fits the R7384 rear cover assembly to the early version E-2 (e SERIES™). Cord caddy slide that fits the R7384 rear cover assembly to the early version E-2 (e SERIES™). This item has been discontinued. 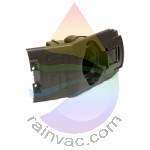 Please order R7383 cord caddy assembly. You can also view in "Related" section below. Right side of cord caddy ear that fits the R7384 rear cover assembly to the early version E-2 (e SERIES™). Left side of cord caddy ear that fits the R7384 rear cover assembly to the early version E-2 (e SERIES™).